Okay, so let’s face it. The current formula for funding technology in education just does not work. Daily, we talk about the need to get technology in the hands of every child. With new and up-and-coming advancements in technology, there will be more of a need to improve infrastructure, bandwidth, servers, wiring, wireless technology and much more if we are to remain current and on the cutting edge. This will all cost money—and lots of it. Currently, districts find it hard just to put a few computers in a classroom, let alone one in every child’s hand. Yes, it can be done—and some districts are making it happen—but in this day of ever-shrinking budgets and more of a focus of passing standardized tests—money, rightfully so or not—is often funneled toward that cause. This leaves school and district budgets looking for ways to be creative in order to make up shortfalls. E-rate funding and grant writing these days is just not enough. We, as leaders, have to start to think outside of the box. We have to get creative in order to help generate revenue to offset some of these added burdens to our district or school’s pocketbook. So, here I go. I will attempt to share some ideas and options we can try to help raise revenue and offset costs. First of all, I never really understood why schools do not take more advantage of the opportunity to generate revenue within their school or district through advertising. Let’s face it: the advertisements are already there at baseball games on scoreboards, outfield walls and much more. They are also at basketball tournaments, sponsored by companies such as Coke or Pepsi. They can be found in many places in our school if we really look for them. Let us be real folks. The technology is readily there for us to take advantage of a tremendous opportunity that passes us by daily. Don’t tell me that you don’t want your child inundated with advertisement daily while learning. Do you take them to the mall? Have you ever been to a professional sports game? Do they watch TV? Advertisements are everywhere. The best part is, our children have also become pros in tuning them out. Have you ever watched a child when a commercial comes on? They stop watching the TV and their mind wanders. They often are not focused on the ads. Why not do as malls do? Schools should purchase digital signage and advertise what is going on in their school on a daily basis. They could also replace hallway peg boards with these signs as well, scanning in and showing off student work. Periodically, these displays could be replaced with advertisements appropriate for students and learning. What advertisements they were and how they were determined could all be worked out. In time, these ads would pay for the initial cost in equipment and setup and more. The additional revenue generated could go directly towards the technology budget. Think about it: digital signs in hallways with schedules, alerts, directions, student work, calendars, videos and much more occasionally interrupted by brief ads by manufacturers of products children were interested in. How about advertisement on devices children were given as well? Let’s say we give them each a tablet computer or cell phone controlled by the school or district. This device obviously could be controlled by the district and filtered for appropriate content. It could also send occasional advertisements to the user to see. The ads would be brief and interrupt learning very little. We could set guidelines on noise, length and more for these devices. If manufacturers were in on reaching this demographic, they would gladly comply to our requests. The revenue generated from this could help pay for the devise itself and more. Think about it: not only will the student have this device in school and be seeing these ads, but they will also take the devise home and see ads all evening and all weekend as well. This is a win-win situation for schools and companies. How about the idea of having real school stores? As an educator, I am aware of many discounts manufacturers offer to teachers and students. I also know that many other students and educators do not know they exist or if they do know they exist, they have no idea where to go to get the discount. Wouldn’t it be nice if you could go to your child’s school and shop in a mini store there, right inside the school, that offered student discounted software, computers, books and more as examples? Discounts could be offered on many products and the revenue generated from their sale could go directly back into the school’s budget for things such as technology. More and more, schools across the globe have been talking about putting course and class work online for their students to do. These sites created by schools and districts could also house advertisements for revenue generation. Sites such as Facebook generate revenue from advertising, so why shouldn’t we? How about the opportunity to generate revenue in the form of things we produce? There used to be bake sales, craft sales and much more that would show off what a student made and therefore be for sale for family or friends to buy from the students and the school. How about if we had classes or lessons that produced things we could sell on a regular basis? We could make podcasts, blogs or apps available for subscription or purchase. We could feed video or audio out on a per purchase or monthly rate. The opportunities are endless. The justification for the cost of the product could be that all profits went right back into the hardware or software used to make these products. These are just some of the many ways we as educators can start to get creative about generating revenue to supplement the ever rising cost of outfitting schools for the 21st century. We need to start the conversation now—or we will miss this opportunity right in front of us. If society wants us to start operating schools more like businesses with a focus on ROI and pay for performance, and if they want to look at test scores as a way to show adequate yearly progress and data to ensure we meet our goals—then we need every aspect of teaching to be more like industry as well. We need to be able to generate our own revenue. We need to be able to compete. We need to rely on those very same companies that are offering to help us solve our problems, to also provide us with the revenue to do so. Great points! We need to ensure our students will be prepared for the future. I, for one, do not buy into the “schools as businesses” trend that some advocate. Education is special just as policing and firefighting are. It’s even more so because our country’s future depends on it. A focus on the financial bottom line can readily lose our proper focus on the learning bottom line. I also abhor the idea that advertising should invade our learning spaces. I don’t like ads all over our high school stadiums. We have huge problem with ads in schools: who decides which ads to show and which to censure? Should beer companies be allowed to advertise to high-school students? What happens when a particular technology vendor offers a big discount to a school if they’re allowed to advertise to the students? What if they offer kick-backs to the technology coordinator? Let’s just not go there. The school store idea could work very well, on the other hand. We should also look at the basic premise here. Should we be spending more money to install more technology in schools? It’s easy to get caught up in the race to have the latest gadgets in classrooms. It’s also foolish. Education institutions tend to be conservative in introducing new ideas and hardware into their classrooms, and they should be. The latest gadget may be just a passing fad. The most cutting-edge technology is always more expensive — by a great deal — than less advanced technology and than the fancy stuff will be in a year or two. Just look at all of the money that’s been spent on interactive white boards (IWB) without considering the fall out. Do they really improve learning or just make teachers’ lives easier or more fun? 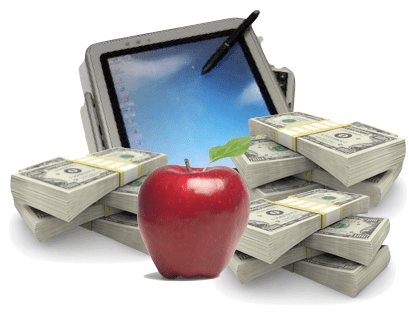 Did your school budget for training and future upgrades? Did they budget for equipment maintenance and repair? How much usage to these expensive devices really see in the classroom? How much of this usage utilizes unique features of this technology when compared with a simple computer and LCD projector? The first place to find funding for your technology budget is in savings. The best saving is not buying something you won’t use or that won’t have a significant positive impact on learning. The next best saving is finding equivalent technology at lower prices. Thank you, Greg, and all . What great observations and what a great article. For too long and in too many places there has been a disconnect between real world business and schools. We need our sense of place, community, and interconnectedness. What are real “partners” in schools anyway, but for the community in which schools and business serve? Educators, being educated in what is educational, can, I believe, monitor advertising and still provide educational and community connections. Thanks for doing what you do!